Water is there where the land ends, and in this natural element ancient and modern civilisations have always found a way of coming together, a life force. 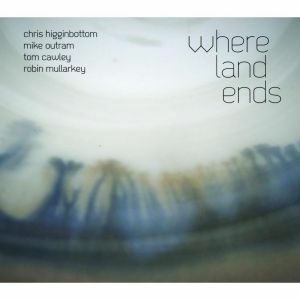 Chris Higginbottom has found his own sense of time and tide with this astute, mature quartet release, a record pooled from discipline, study, and performed here with great skill. The drummer composer has been on quite a journey that a decade ago saw him studying at the New School in New York whose new generation alumni have included Robert Glasper and Bilal. 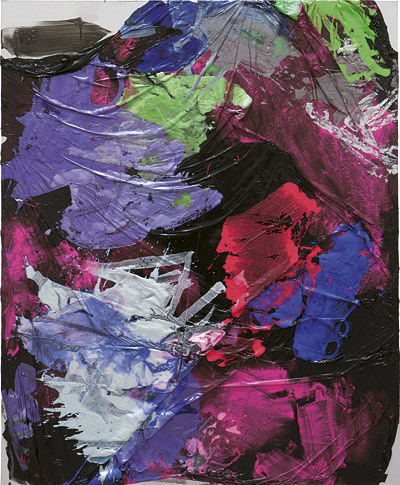 Higginbottom’s career since has seen him return to the UK following a fruitful period in the States, but it’s seven years since he released his album One. More acoustically inclined that debut outing was recorded in America with a band that included the formidable US saxophonist Seamus Blake. On Where Land Ends recorded in London at the same studio as the recent Ivo Neame record Yatra there isn’t a sax in sight, instead the album is characterised initially by the agenda-setting jazz-rock guitar of Mike Outram with former Acoustic Ladyland keyboardist Tom Cawley (who’s on another fine drummer Tom Bancroft’s First Hello to Last Goodbye), and impressive electric bassist Robin Mullarkey. Listen to Cawley’s part say on ‘The Wide Open’ for an example of some of the light and shade on this six-tracker that thankfully does not burn itself out too quickly, although at times you’re wondering what the musical satnav of the band is set for, as clearly no one wants to give the destination away until you as a listener get there. The blues-rock that in the 1960s, on the London scene at least, jazz-rock learned from and then promptly discarded comes to the fore a little (say on ‘Taters in the Mould’), but there’s no exhausting charging about or retro cul de sacs anywhere to be found on this record even if there is the odd nod to the likes of a classic later jazz-rock behemoth like Return to Forever (in terms of what Cawley is doing) and even Derek Trucks-like Indofusion in the latter part of the record, in the hands of Outram. Higginbottom knows how to pace things, a bit like Adam Nussbaum plays perhaps, and in his tunes he has come up with some great material for the band that is as strong as say those by drummer/composer Alyn Cosker on his album Lyn’s Une, the last time for me an essentially straightahead UK jazz drummer/composer made such an impact from a compositional point of view clearly pushing outside the core of his style. I don’t want to give the plot away too much, and this album does have a sort of narrative because the track sequencing is well thought-through, but zone in on what’s happening after about six minutes on the epic title track with the quick-as-a-flash bass line, Indo-jazz vignettes and a barnstorming guitar solo. Released on Monday 29 October. 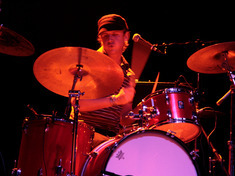 Chris Higginbottom plays a F-IRE Festival gig that night with his band at the Pizza Express Jazz Club, London W1. 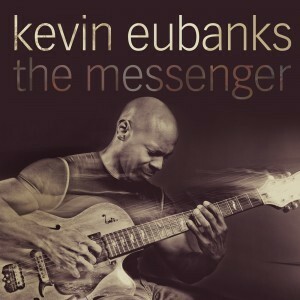 Guitarist Kevin Eubanks is to release The Messenger next week, his second album for US label Mack Avenue following on from Zen Food from two years ago. Coming out in the UK some five months ahead of its US release, the Philadelphian, who in the early-1980s was a member of Art Blakey’s Jazz Messengers, and until two years ago was well known in the States for his long tenure in The Tonight Show leading Jay Leno’s house band, has written most of the tunes of the album with tracks including ‘JB’, a tribute to James Brown, Jeff Beck’s ‘Led Boots’, and Trane’s ‘Resolution’, from A Love Supreme like you’ve never heard it before, with a striking vocal bass line sung by Take 6’s Alvin Chea. Eubanks’ band sees the guitarist joined by reedsman Billy Pierce, bassist Rene Camacho, long time drum pal Marvin “Smitty” Smith, Joey De Leon, Jr. on percussion with Eubanks’ younger brother Duane on trumpet on three tracks, and older brother Robin on trombone on a brace of numbers. Explaining the title track Eubanks has said: “There is an urgency about it; it has the energy of a message that really should get across. The Messenger, I feel, is in everyone. We’re at the point that whatever it is that you feel strongly about, that can help a person or persons that you love, or a situation that affects your life…you should let that message out”. The album opens uptempo with the percussion driven title track softly opening out to Billy Pierce’s sax line and a vibrant bass figure, with Eubanks opening up the throttle to give the band a pacey run out. Born into a musical family on 15 November 1957 Eubanks’ mother Vera was a composer and held a doctorate in music, and Kevin had two musical uncles, the great pianist Ray and Tommy Bryant, so it was natural in a way that Eubanks would go into music. 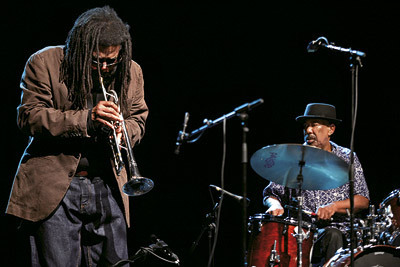 It was hardly a surprise that he firstly moved to Boston to study at Berklee with a bunch of influences in his head including the likes of John McLaughlin and George Benson, although his life was to be changed forever by touring with the great Blakey and work with other leaders including Sam Rivers. 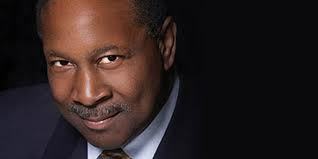 Eubanks’ career took a fusion turn in the 1980s with a bunch of records for GRP including Face to Face and Promise of Tomorrow that perhaps did not totally show the full roundness of his musical personality. In the 1990s though he changed tack and was in a memorable trio with ex-Miles Davis bassist Dave Holland and percussionist Mino Cinelu for a while that really showed what he could do, as a stylish soulful guitarist capable of appealing to straightahead, fusion and jazz-rock fans alike. 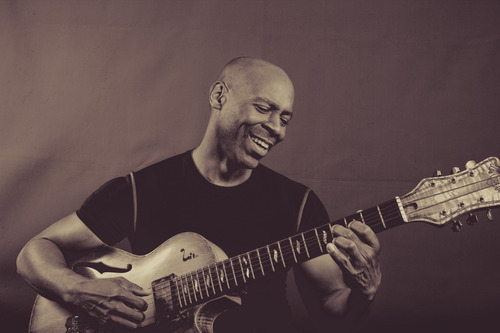 Eubanks was as recently as the summer just past playing with Holland once again for some tour dates by the much fancied band they’re calling Prism, also featuring pianist Craig Taborn and drummer Eric Harland. The tenderness of George Benson comes across on a track like ‘Sister Veil’ on The Messenger, while tackling ‘Resolution’ could be seen as a risk few would undertake lightly comes off winningly with that light funk and dancefloor-friendly feel certainly blowing a few cobwebs off some overly studious approaches to the track you might have come across. ‘JB’ takes up the mantle of that other great Phillie jazz player Christian McBride whose affection for the music of James Brown is widely understood, and this quietly engrossing song is all about the build and in this it’s clear Rene Camacho’s role is an important presence on the album, but so too is Robin Eubanks who also shines here as the trombone gathers some seriously sinuous pace. ‘420’ has great drive with a late-Milesian feel, although Kevin Eubanks’ lightly strung sound here is more reminiscent of the approach of a player such as the UK’s Tony Remy than say Mike Stern, one of Miles’ most favoured guitarists during his latter years on the planet. ‘Led Boots’ is simply infectious and may well prove to be the album’s main talking point taking its cue from Max Middleton’s penned homage to Led Zep on Beck’s 1976 album Wired. But don’t expect a power version of the classic, it’s not what Eubanks is all about. Softly insistent ‘M.I.N.D’, ‘Queen of Hearts’, ‘The Gloaming’, a beautiful charmer worked around acoustic guitar and saxophone, as is the supermelodic slow ‘Loved Ones’, all have plenty of character, but ‘Ghost Dog Blues’ with its compelling momentum alters the scope of the album just as it seems to be becoming a little too ballad-heavy. A very classy album indeed that marks a welcome return of a player whose quality is beyond a shadow of a doubt. The Messenger cleverly steers a path away from some sort of slick confection that would turn a lot of people off. Instead we’ll all want to talk about Kevin.